Wall rendering is a wall covering method applied to external walls to protect the brickwork. There are different styles of render and plasterers will be able to advise on the options available, and the best solution for your property. This article discusses these different types of render and the prices for rendering different types of UK homes. Rendering uses more cement in the mixture, as well as coarse sand, to increase the strength of the walls and offer protection against the weather including rain and snow. Less cement is used in a plaster mixture, together with fine sand, to attain a finer, smoother finish that’s easier to paint and decorate. Rendering external walls requires access and safety equipment in the form of scaffolding towers, which adds a more money to the overall costs. Also, the type of render you choose will affect price, with “pebbledash” render costing more than “smooth” render. The following sections of this article will give you pricing guide on rendering prices for typical UK houses. The cost of rendering a 3 bedroom semi-detached house is typically £3,800-£5,200. The table below looks at the typical prices for rendering 2 bedroom bungalow, 3 bed semi-detached house and a 4 bedroom detached house. Please continue reading to find out more information about rendering. Masonry paint is always applied to render to prevent moisture penetration, which often leads to premature failure of the render. The price below does not include the painting. Plasterers will take between 4 and 6 days and the job will cost in the range £2,100-£3,000. Applying render to a two story house will require the use of scaffolding for safe access at height. The plasterers will remove all the existing render, if any, key and repoint the brickwork and apply two layers of flat render and a sponge finish. Where you live in the UK, regional price variations come into play. The size of the company you contract. Large building companies have more overheads and generally price up their jobs to cover costs. The demand for building services in your area, summer is ideal for building work because it is dry. Accessibility to your house may also be an issue for plasterers. Always make sure all the quotes you receive for the work are itemised. Itemisation makes it easier to compare the quotes from different plastering companies. A detached house on two floors will require scaffolding, and the guide price below includes scaffolding. The surface area to render is also bigger and so you should expect the price to be more than for a semi-detached property. The job will take a few days longer with estimates of completion between 1 and 2 weeks. As in the jobs above, the plasterer will remove existing render, apply two layers of flat render and a sponge finish. The cost should be between £6,300 and £7,800. Smooth render is rather basic and going for pebbledash adds that extra element of beauty to the exterior of your home. Also, painting protects your external walls and ensures the render lasts for years to come. This part of the article provides a guide price for pebbledash render on a 3 bedroom detached house finished with a double coat of masonry paint. Due to the uneven surface of pebbledash, the painting is labour intensive as it takes focused attention to ensure all the surface is covered. The complete job will take over two weeks to complete and will cost between £4,000 and £7,000 depending on the size of the business and the other pricing factors discussed in earlier sections. Rated People offer homeowners just like you a trusted platform to obtain quotes for a variety of home improvement projects, including external rendering. 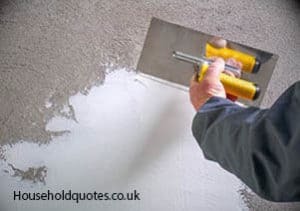 Finding a reputable and trusted plastering company has become harder as everyone can now afford a website where they are in control of the information presented. Get your rendering quotes from here today. Wanted to know how much it would cost to render the house – there is about 300sq metre of space to cover with 6 windows. hi Just done a job in kings heat, Birmingham, using Weber colour through monocouche render @£40 per metre. Get Your FREE Rendering Quotes NOW!